The preview of ideas for Southwest Detroit is posted by Human Scale Studio, a year-old Detroit consultancy. firm. The concept renderings were done in collaboration with the RTA, Parsons Brinckerhoff Engineering Services and AECOM. The transit authority — a state-created board with 10 members representing Detroit, Wayne, Macomb, Oakland and Washtenaw — expects to issue a master plan by summer as the kickoff of a November millage campaign in the four counties. 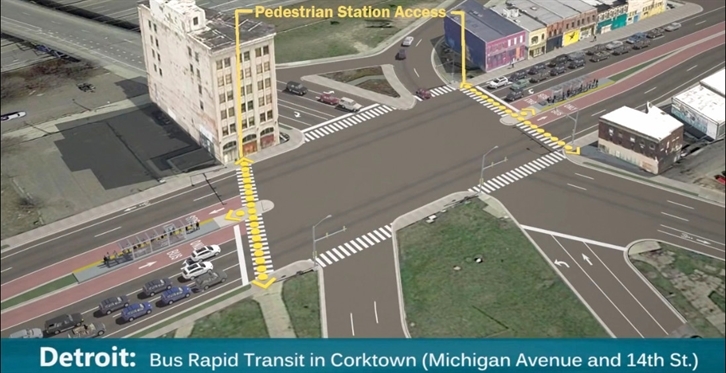 This image represents the consensus of Corktown residents and small business desires -- extended sidewalk, protected bike lane and center-running Bus Rapid Transit. . . .This is the official plan being pushed forward at the state and regional levels. . . . This makes voting for the RTA all the more important in November. It's about more than just voting for Bus Rapid Transit, it's also about voting for a more bikable and walkable region. The task now shifts from reimagination of the street to staging it properly. There is no reason we have to wait for BRT to come online for us to get extended sidewalks and a protected bike-lane. If BRT won't happen on Michigan Avenue for a decade, then we can still have nice things in the interim. We need to make that clear to the powers that be. The concept in Dearborn proposes curbside rapid bus lanes. Rapid transit buses use separated lanes reserved for them and can load at center median stops, as illustrated. Tickets are pre-purchased from dispensers, freeing the operator from time-consuming fare collection at each stop. According to a Michigan Avenue Corridor community presentation last October by the RTA, route proposals go from downtown to Ann Arbor or to Detroit Metro Airport. Stations are envisioned every half-mile to mile. Service frequency would be every 10 minutes during peak commuting hours and every 15 minutes at other times. "I love that this bus in headed to the airport." "I'm in love with those bike lanes." "Hell, as long as the potholes and awful cobblestones are gone, I'm a happy camper." "No parking meters? Man, the future is awesome." "The issue will be on the ballot this November. There's a very good chance this will actually happen. It's also being supported by businessmen like Dan Gilbert." "It's going to be an uphill battle." "There's a vote in November to pay for these entirely sensible upgrade. So if you like the concept, you should vote yes and encourage others to do so." "Hell, even if you're never going to set foot on a bus or tram in your life, you should still vote yes. Regional transit is a huge economic engine that we desperately need." "I love that they're actually proposing BRT. . . . While I like rails, I think we need BRT first to build up ridership and culture around public transit use. Plus BRT routes are way more flexible in where they can be made." 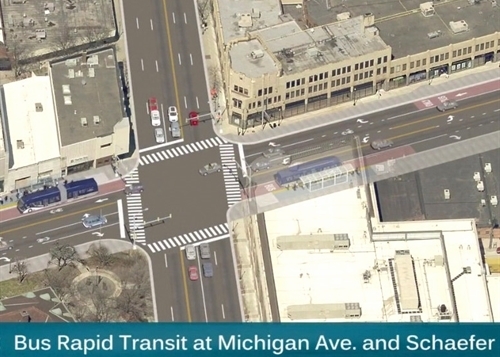 Graphic shows how Southwest Detroit riders would reach center island stops via crosswalks.